Often used as a first-line imaging modality by the primary care or emergency room physician due to its ready availability. Not the ideal study as artifact secondary to bony structures in the region of the cervicomedullary junction greatly limits its versatility. 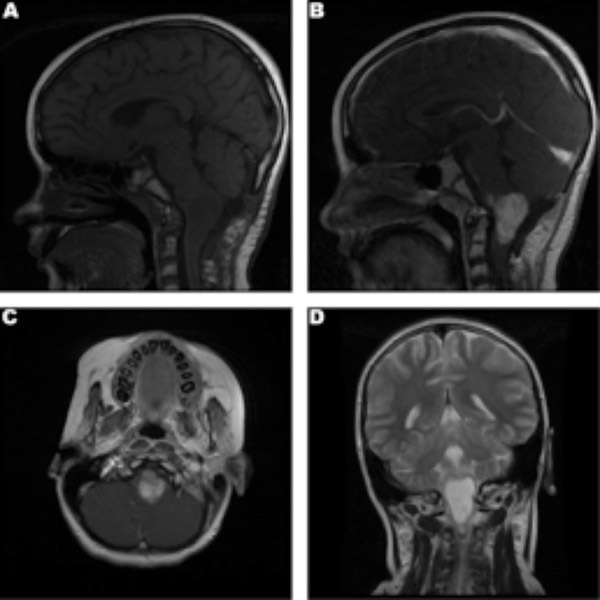 Patients suspected of having a cervicomedullary tumor should undergo MRI studies of the brain and cervical spine with and without gadolinium to determine the extent of tumor growth and involvement. Cervicomedullary gliomas arise in either the medulla or spinal cord: The pattern of growth of the tumor will give some hint as to its epicenter and what structures are being placed at risk by potential tumor growth. Tumors arising in spinal cord turn dorsal: Tumors with epicenters in the upper spinal cord will have their rostral growth blocked by the decussating fibers of the sensory and motor pathways. Instead, the tumor curves dorsally to grow into the cisterna magna at the cervicomedullary junction. Tumors arising in medulla grow centrifugally: Tumors with epicenters in the medulla oblongata grow centrifugally as focal nodules pushing the surrounding fiber tracts to their side. 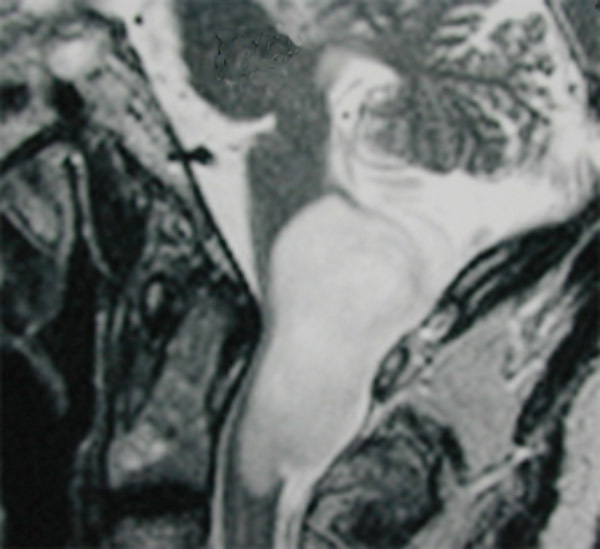 T2-weighted sagittal MRI of a cervicomedullary glioma: Shown is a cervicomedullary tumor whose epicenter is in the upper spinal cord. 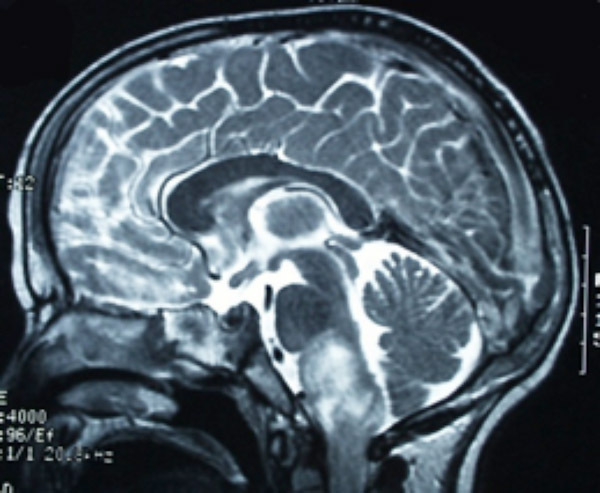 T2-weighted sagittal MRI of a cervicomedullary glioma: Shown is a cervicomedullary tumor whose origin is within the medulla oblongata and growth is centrifugal.